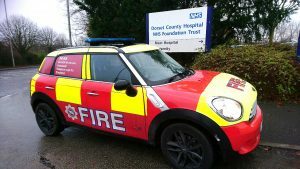 Dorset and Wiltshire Fire and Rescue Service (DWFRS) is joining forces with Dorset County Hospital (DCH) and Dorset Adult and Community Social Care on a trial Safe and Well campaign called ‘Help You Home’. Working closely with the British Red Cross, Help You Home builds upon DWFRS’s Support at Home campaign by using service volunteers to help deliver the swift and safe discharge of patients from DCH to get them home, then providing support to allow them to return to independence. The pilot scheme will work with three wards in the hospital and will include the patients being offered free Safe and Well checks from DWFRS. If successful, the scheme is expected to be expanded across the hospital. The service is free, flexible, strictly confidential, and is provided by skilled and trained volunteers all of which have had an enhanced Disclosure and Barring Service (DBS) check.